Below are some case studies of my work for adidas Group, Land Securities (for Salterbaxter), Xstrata and Metso Corporation (for Two Tomorrows) that show what I can achieve for my clients. Or view a more comprehensive list of my recent projects. The adidas Group has been producing sustainability reports since the year 2000 and I have advised and been lead writer and editor on all of them. I have helped them understand stakeholder expectations and to develop their reporting over eleven years. The first reports were printed and with growing general interest in sustainability issues, the online progress report is now supplemented with content on the corporate website. As well as ensuring their reports are rigorous and clear, I have encouraged them to use engaging narrative devices to tell their sustainability story. So I have written scripts for video overviews and CEO statements, magazine-style interviews and Q&As. Two of these reports won top prize in the German accounting body’s annual awards for sustainability reporting and the adidas Group is now recognised as a leader in sustainability reporting and accountability within the apparel and footwear sector. Companies don’t act, people do. Telling good employee stories helps lift a report from being all about systems and targets and, if used in the right way, can help spur other employees into action. And interviewing employees is the best way to get a great story. When commissioned to write the Land Securities 2008 CR report, the team had decided on case studies about some of their best employees. Head office knew of some exemplary work at their Gunwharf Quays shopping centre in Portsmouth and, being ex-journalists, recognised the value in sending me down there to interview the centre manager. Gunwharf Quays has bars and a casino as well as shops and there had been some public order issues. The centre manager had managed to engage enough of the people working in the stores to join him in becoming trained as special constables – volunteer police ­– so they could improve safety and security. And it had worked – a good story of employee initiative and successful partnership working. What made it a great story was when the centre manager told me his dead father would have been proud of him… because he had been a policeman. Head office didn’t know that. 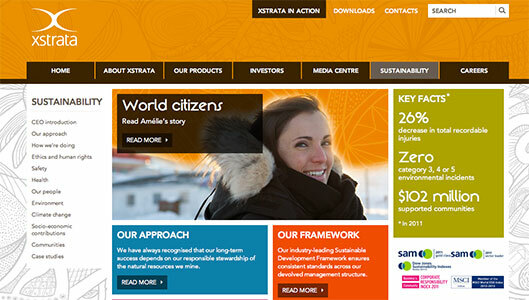 One company that asked me to help them answer this question was mining giant Xstrata plc. Having decided to reduce the length of their report and publish more on their website, they wanted to ensure the content across the two platforms was complete. I rewrote the top-level pages in the sustainability section of the corporate website in concise, straightforward language. And having reviewed the Global Reporting Initiative guidelines for the mining and metals sector, I ensured the lower-level pages comprehensively covered their material issues. The result is that both expert and lay audiences can find what they need from the corporate website and it successfully complements the company’s sustainability report. I was commissioned to articulate the sustainability strategy for this global supplier of technology and services to companies in the process industries such as mining and pulp and paper. The brief was to avoid the fluffiness and jargon so prevalent in many such company statements. The client explicitly stated he did not want to see all the ‘right’ management buzzwords. After an initial conversation and a review of relevant materials, I prepared an interview with the client to explore options for inclusion and degrees of emphasis. My draft needed just one round of amends before the client signed it off, describing it as ‘close to perfection’. View a more comprehensive list of my recent projects.